These kids were on a mission! 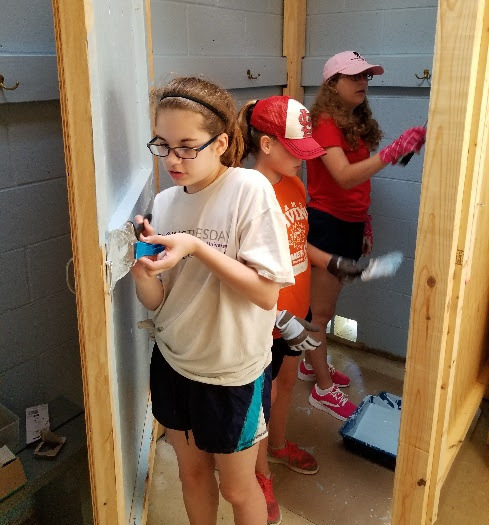 While DuBois Center’s summer staff were learning more about activity leadership, behavior management and safety procedures, eleven youth and two adults from O’Fallon UCC tackled a laundry list of work projects. The newly-installed beach house stall dividers got a fresh coat of paint – and so did quite a few arms and legs! The crew tackled major weeding projects at the labyrinth and Rustic chapel. They also joined the summer staff in traditional staff-bonding projects – prepping the barn and waterfront for campers! Nothing builds camaraderie like raking algae out of the swim area, pulling weeds from the beach, and stripping and re-bedding stalls in the barn. 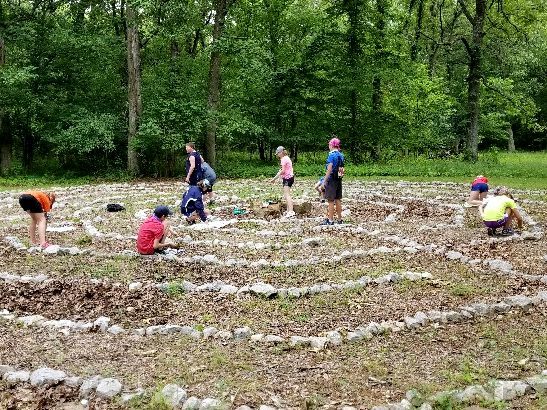 On top of all that, the O’Fallon crew helped organize the barn safety equipment, inspected the lake inflatables to locate holes to patch, and deep cleaned the shelter at Lily Pad Landing – the initial greeting point for Rustic campers. Thanks to their hard work and dedication, many projects were checked off the list that otherwise may not have been completed. A big SHOUT-OUT to the team from O’Fallon UCC – you guys ROCK! ← Welcome Team – Join Us! How wonderful that they were able to lend a hand and help complete projects. It was a good experience for them.